Last Saturday (30th June 2018), our CEO Keith Jenkins was in Athens with Shelene Satar, International Media & Digital PR Officer at VisitBritain, to attend the awards ceremony for the World Travel Awards. iambassador had been nominated for an award in the Europe’s Leading Marketing Campaign category alongside VisitBritain for the collaborative campaign 24 Hours in the UK. We are very, very proud to announce that WE WON!! iambassador CEO, Keith Jenkins, and International Media & Digital PR Officer at VisitBritain, Shelene Satar, were in Athens to pick up the award. 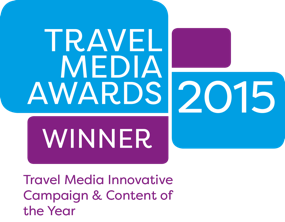 Our second win at the World Travel Awards! This win comes as iambassador’s second World Travel Award in as many years, after we won in the same category for #EuroFoodTrip in collaboration with Emilia-Romagna Tourism and Costa Brava Girona Tourist Board in 2017. This second win also confirms that online marketing campaigns that harness the reach of influencers are very much here to stay, and are a direction all DMOs should be thinking about moving in. Keith attended the glamorous awards ceremony at the historic Zappeion Megaron Hall in Athens with Shelene Satar from VisitBritain and below you can find some photos taken during the evening. It’s an honour to have won this award with VisitBritain – and is the second award we share after the Social Travel Summit in Inverness won a PR Week Global Award in 2017 – and it has left us all very excited to work together again on STS Belfast which takes place in September this year. Keith & Shelene attended the lavish awards ceremony in Athens. The awards ceremony was held in the historic Zappeion Megaron Hall. Keith & Shelene pickd up the award for Europe’s Leading Marketing Campaign. ..and a media interview with TV5 du Monde. 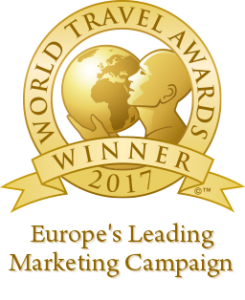 This is iambassador’s second World Travel Award win after we won in the same category last year for the EuroFoodTrip campaign. 24 Hours in the UK was a large-scale content creation campaign that saw a team of ten British and international iambassador influencers travel across England, Wales, Scotland and Northern Ireland and document 24 hours of their travels on video. This resulted in 32 individual videos that were then shared on the hour, every hour over a 24-hour period on 15th January 2018. This day is so-called “Blue Monday” because research suggests it’s one of the saddest days of the year, but this campaign aimed to turn that on its head and inspire travellers from all over the world to enjoy some of the best activities and experiences on offer in the UK. After the 24-hour campaign, fans were asked to vote for their favourite experiences. Voting videos were released asking fans to choose between two experiences at a time. The voting videos performed very well receiving more than 150,000 views and interactions. In total, the campaign reached over 3 million individual social media accounts and the Facebook videos were watched by over 500,000 people. We would like to thank everyone who voted for us and helped to spread the word about our nomination in the lead-up to the World Travel Awards. Our thanks also to all those who took part in the campaign itself from regional and local partners, to all the influencers and bloggers who created such fantastic content, and the members of the iambassador network who shared the content. And of course, a very special thank you to our partners VisitBritain who made working on this award-winning campaign so much fun!